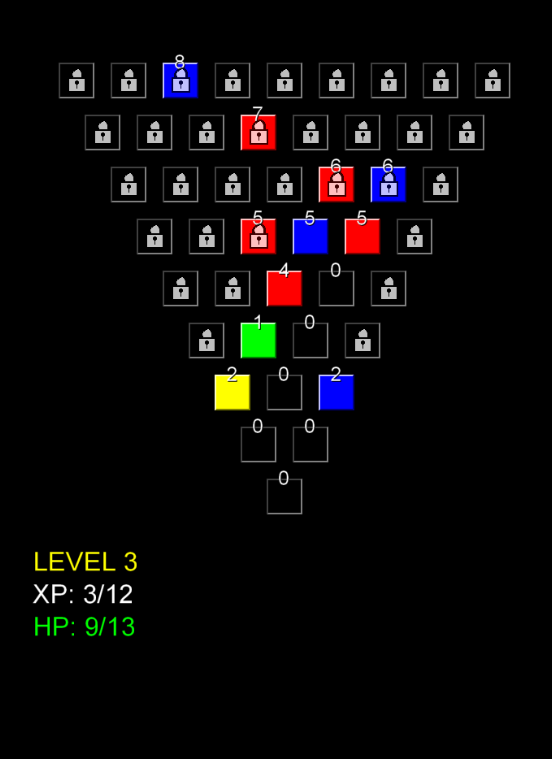 Inspired by the numerous "card dungeon" style games on mobile, I'm building an RPG lite which structures the card deck like an inverse pyramid. Players begin at the bottom of a tropey ol' dungeon and work their way to the top, negotiating hazards and gradually revealing a broader playfield along the way. At this point, I have a mechanically complete prototype on hand (all game rules in place and a win state coded in). It is still ugly and unintelligible, but I'm quite pleased with reaching this point by Saturday evening. All of my work from here can be dedicated to appearance, usability and game balance without worrying about being "finished". 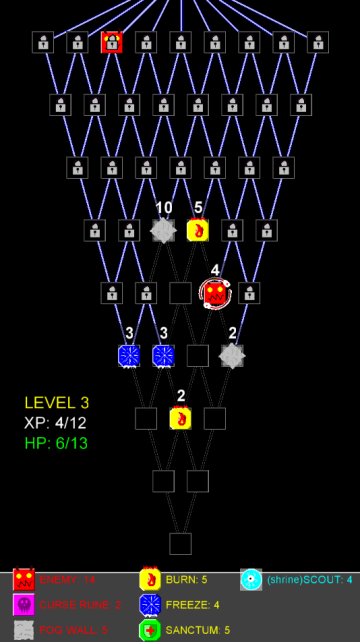 I'll be looking to make an experience that is clear, simple and intuitive, and the gameplay should be oriented around the player carefully managing their "escalating possibilities": every action brings them closer to uncovering the whole board, but revealing too much at once can set them against an overwhelming number of enemies. The game has now reached a state that I shall call "Minimum Viable Coherency". First draft of usability and balance tweaks with some crude UI to show all important information. People should, with some difficulty and enough determination, be able to figure out the game elements and rules. Here I've been juicing up interactions a bit more to make them sliiiiiiightly easier to discern. It's still a really complicated system to learn and master so today I may be applying the blunt hammer of blatant tutorial levels to achieve my goals of understandability. 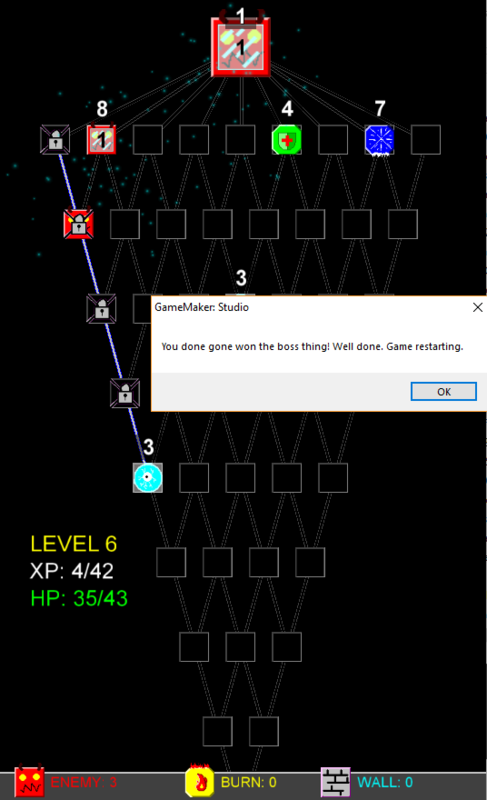 There is also a "proper" endgame in the form of a boss. Winning is quite difficult right now, so good luck if you want to try! Hey. You are dead right on the game being damn hard at the moment haha. I couldn't beat it, needed more burns as the enemies were way too many. That said, I did like the challenge, so I would say don't make any major balance changes just yet (see below). I did struggle deducting exactly what each type of "card" did, and that made the game a lot more difficult. So once those details and interactions are cleared up, I would like to try again and see how I fare. Perhaps just add hover tool tips or a info section that shows below the cards, that when you hover over a card shows you details of how they work and interact. Thanks, this is great feedback! Gives me a lot of interesting things to consider and I think it can funnel my efforts well. I especially like the consideration to rule consistency. @Nandrew don't have time to play right now! Looking forward to playing the builds altogether to see it evolve! Thanks @Bensonance ! I hope this helps as many people as possible! My final build for the 48hr deadline is here. I'm quite pleased with it, all things considered! - Responding to feedback in a jam is difficult, but always worthwhile if you can manage it. In this case, I had to evaluate the concerns raised and decided the fastest way to address them was including the given issues among the tutorial messages. This put emphasis on (1) showing enemy attack rules as clearly as possible and (2) demonstrating how efficiently a single BURN charge can be used. - The tutorial is still very incomplete and given WAY more time I would expand and refine it. Also unfortunately couldn't make use of tooltips (partially time, partially because I was building a mobile-first experience) but I would look at context-sensitive information on a longer project. - Similarly, the game is not nearly as clear as I would hope it to be on moment-to-moment processes (better health/XP/levelling feedback, combat sequencing, and SOUNDS!) but this is to be expected and I did my best to cram in what could be implemented most quickly. Enjoy! The game is still hard but if you figure out all of the tricks it becomes reliably beatable. Man should have looked at this earlier, might have steered me into focusing on creating something more mechanically sound. Suddenly hard indeed, but I found myself clicking away and getting sucked in, that's cool. Glad to hear it! I'm inspired to keep working on it (don't we all say that?) and would like to see about smaller and tighter level design, while still leveraging the interesting reveal choices that can be present in this version. This is pretty damn great! The first gripe is that it's quite opaque to understand, even despite the pretty great tutorial. The way each of the card/tile/thing works takes some figuring out - and that's after working out how the core works. It's a pretty elegant system, again, once you figure it all out! The randomness in difficulty is obviously very harsh, with better and more refined procedural generation I'm sure a lot of those can be made much more sensible. Scrying is a spell but enemies attack you when scrying? And perhaps some kind of "you will die if you don't do anything about it" indicator a la what DD had with its "are you sure you want to die?" prompt? The fact that you had all the icons at the bottom feels like a natural place to put tooltips (hold/tap on them to see what they do). This was great fun trying to figure out what tiles did what. Kudos for adding the tutorial level, I enjoyed it and it served it's purpose well. I would actually like many smaller levels that gradually grow in size to help learn the mechanics on my way to the larger level. You could add some fun level names like "Cavern of despair" etc which would make the levels memorable and add some kind of context to each area as well as named bosses. The large upside down pyramid made me feel a bit like standing at the foot of mt Everest and looking up to the top in awe before climbing it. I do like how you can see the whole level layout before you start rather than revealing it say 1 stack at a time as the progression possibilities sets a challenge to the player. I would go for asymmetrical levels personally to make it feel like exploring a grotto/cave system perhaps. Choosing the right tiles is strategic, but more deterministic elements alongside the random elements could also make it feel more like strategy rather than luck. For instance you could add a single item slot that the player can add to and discard from which might add that deterministic element. What to keep and what to leave behind. Awesome an fun! I did beat the game and enjoyed it a lot... Proof! Fun, simple dungeon crawling adventure. Good job! Really enjoy how spells attack all enemies on the map, allowed for some cool chain attacks near the end. 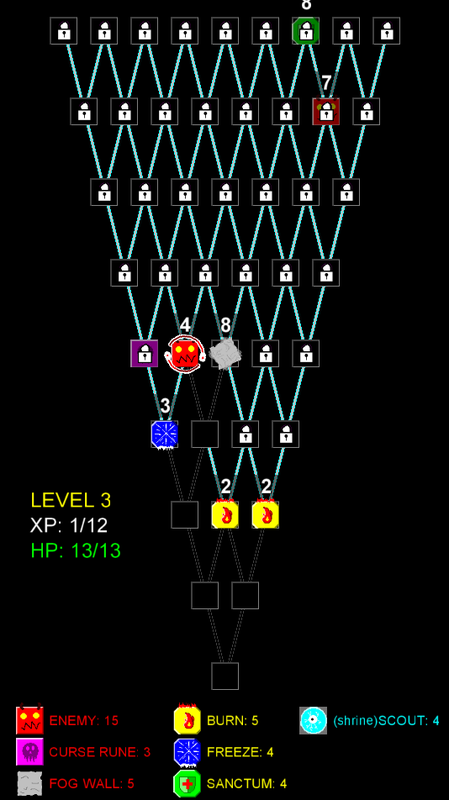 There were few cases where too many enemies got revealed at once and I got squashed by luck of the draw so maybe the random generation needs some tweaking? Had a good time though, nice work. Comments and direction have been appreciated, I still want to justify putting more work into this and have a few good areas to strike at if that comes to pass!